Fórsa women activists from around the country took part in INSPIRE training last Saturday. This was the third year the union ran the training, which aims to inspire and empower female activists. The training included workshops on confidence-building, communications and campaigning, and an impressive panel of speakers – including former RTÉ political correspondent, Martina Fitzgerald and Claire Power, advisor to President Michael D. Higgins – shared their experiences of working in prominent positions. 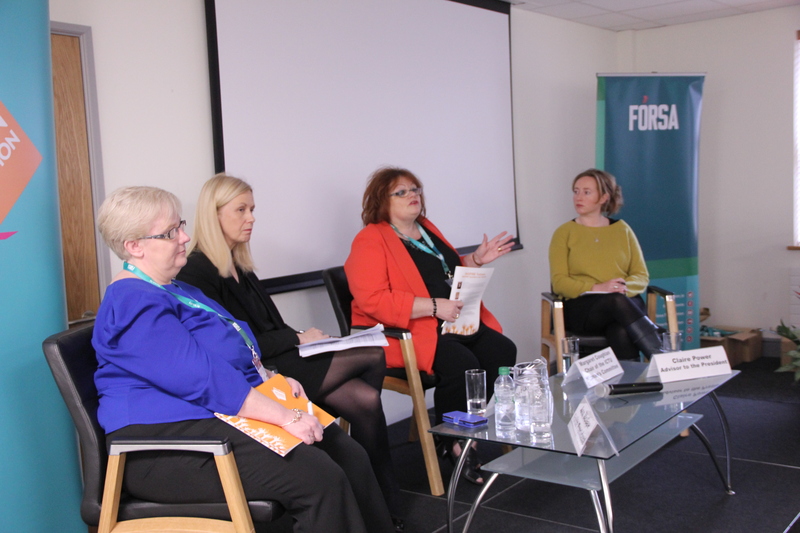 That Q&A session was facilitated by experienced Fórsa activists Margaret Coughlan, who chairs ICTU’s women’s committee and also featured Fórsa president Ann McGee. Martina Fitzgerald made the point that women are often described as being feisty, strident and emotional, while men who act in the same way are considered assertive and ambitious. Claire Power said women are often apologetic in their speech, prefacing a question or interjection with “I’m sorry, but…” or something similar. Claire Power said women are often apologetic in their speech, prefacing a question or interjection with “I’m sorry, but…” or something similar. She urged delegates to be confident in their contributions, saying they were just as valid as anyone else’s. Ann spoke about how being born with spina bifida made her so much more resilient than she would have been without it. “In order to be successful, you must strive to turn a perceived negative into a positive and use that to your advantage,” she said. Ann spoke about how being born with spina bifida made her so much more resilient than she would have been without it. Although Fórsa membership is comprised of 69% women, the majority of senior positions are held by men. Seminars like these aim to change the status quo and encourage more women to step up and run for elections to have their voices heard both within the union and beyond.